As Elida and Stelling fly through the stars together, a terrible twist occurs in this issue of Vagrant Queen! I like Elida as a character. She’s a no-nonsense space lady who’s been running from the law for most of her life and has a taste for adventure. The tension between Elida and Stelling is great. I like that they’re a duo forced together through need, both of them trying to gain something from the other. I like the extra twist of their history, how it makes their shaky alliance almost a bittersweet one. I also like that there’s such a thing as “Phot’ggh the Slavering Turkey God”. That’s just such a fabulous name for a god, it’s so hilarious. I love the art of this comic. It reminds me of a vastly superior version of the art for the Star Wars Christmas Special, which may sound weird to say, but it really does. It has these long faces, these defiantly styled hair for characters, these eighties envisionings of grungy space attire that really work well with the characters. I also love how boxy their ship is. There’s something fun about how retro it looks. The fight scene is probably my favorite. You can really see the attention to movement and positioning throughout the panels. How Stelling punches, how Elida falls, how Elida crouches and where Stelling lies on the ground when he chooses to save the whiskey over trying to grab the gun—I like the subtle touches of how a hand is placed, how a body smooshes onto a wall. The coloring is really fantastic. From the splashes of purples and blues for space speckled with splotches of white stars to dramatic moments with solid backgrounds that feel like someone dripped water onto a painted sheet of paper, the use of coloring in the backgrounds is spectacular. How solid the colors are on the characters along with the noir shadowing in important scenes makes the moods of the panels, providing a layer of atmosphere to the page. I also like the lettering in this comic. I like that the thought boxes sometimes get dramatic background coloring, I feel like that just adds to the tension in a scene. 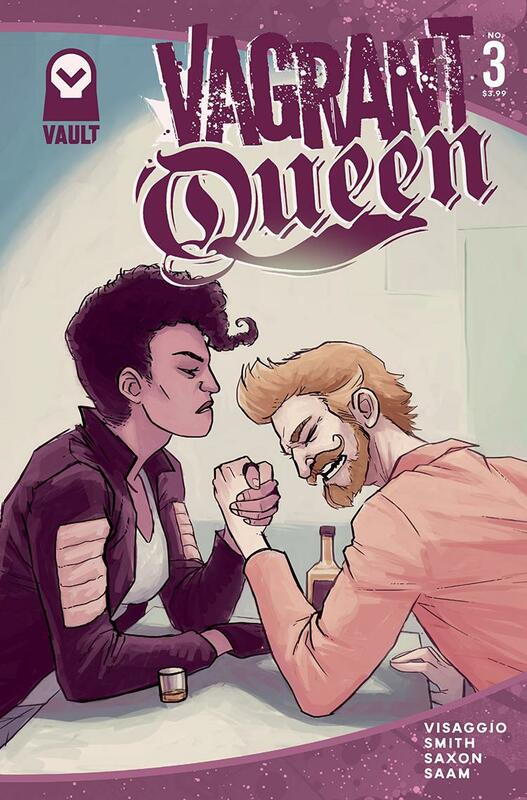 If you like space operas, definitely check out Vagrant Queen. It’s a fun, eighties kind of gritty space and would be an easy to catch up on since there’s only three issues out so far.